NEWS REPORT: Three special awards were given away to successful European handball teams last weekend. Usually we see them dressed in jerseys, trainers and sweat fighting for the sports distinctions on the courts. Last weekend they changed the scenery and were awarded for their hard work done in the past year. Danish and Polish handball stood up on pedestals of domestic sports contests. At the Danish Sports Award on DR TV Saturday night, the male national team of Denmark were awarded BT Gold, the oldest and finest awards in Danish sport, powered by the newspaper BT. 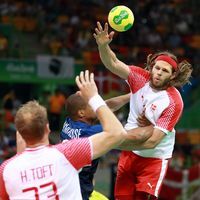 The handball team, who found time to take part in the award party in a break in their preparations for the upcoming World Championship, got the award for winning the Olympic Gold in Rio last August, the first Olympic medal ever for a Danish men's team. “This award obviously means a lot to us, not least as it is based on votes from the athletes themselves,” said goalkeeper and team captain Niklas Landin as he thanked for the award on behalf of the team. At the official gala of the Best Athlete Contest organised by the oldest sports journal “Przeglad Sportowy”and the national TVP two big events were honored. Firstly, Vive Tauron Kielce were chosen the best club team of the year for winning the VELUX EHF Champions League and remaining unbeaten on a domestic floor. “One penalty and we are on the top,” said Michal Jurecki holding the statuette on the stage. “For me as the captain, it’s a huge distinction. On behalf of myself and the team I would like to thank the coaches, medical staff, the club and especially (club owner) Bertus Servaas, without whom we wouldn’t achieve the success,” Jurecki added. Secondly, the EHF EURO 2016 was found the sports event of the year. Thousands of spectators in the stands, millions in front of TV, perfect organisation and records beaten - the recent handball festival in Poland had no competition. The tournament was broadcasted to 175 countries and the official EHF website had 900,000 guests what was 44% more than at the EHF EURO 2014. In addition, in the main part of the voting for the Best Athlete of the Year, Kielce's and Poland national team left back Karol Bielecki found himself in the Top 10, taking the ninth position in the end.